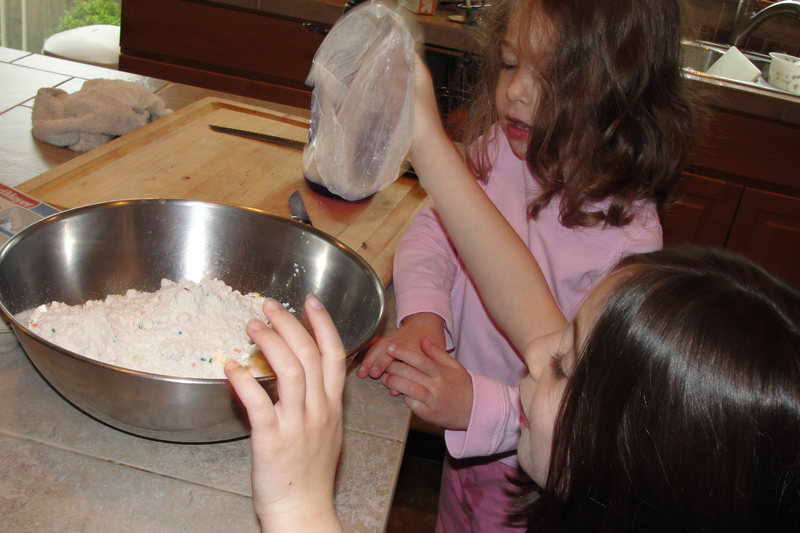 kids cook | eat. play. sleep. Ava has always been into doing what the Mama does – at 18 months, she was dusting with her own wet wipe or “sweeping” with a shortened Swiffer broom. She’s always loved to help cook or bake or work on any crafty project with me. Emily just likes to do whatever her big sister can do. She is such a pro at kneading bread dough and shaping the loaves. I love that she likes to put her hand print into the bottom of the loaves. Recently, the kids have found that a lot of the things we make are things that they can just make by themselves. I don’t even need to read the directions, these days! It started with making their own breakfast – cereal and milk are easily accessible in this house, as are the plastic bowls and spoons. We made cake mix cookies the other day and I literally didn’t do anything except snap pictures and lick frosting off of the spoon. Ava can even turn the oven to the correct temperature. 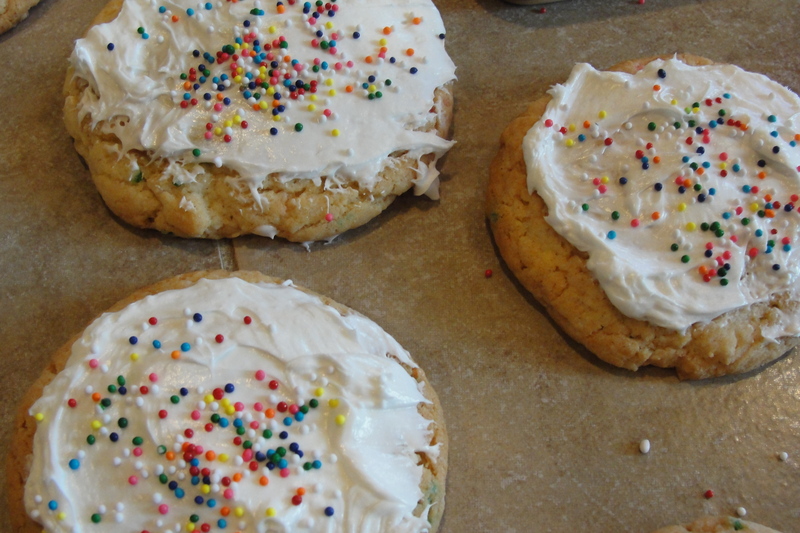 Funfetti…it makes the BEST cookies! 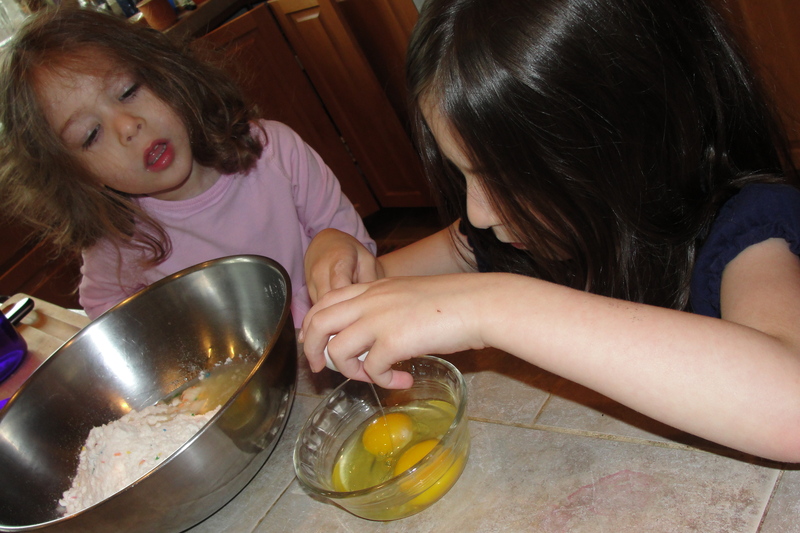 Ava cracks the eggs into a small bowl, then Emily dumps them into the mixing bowl. 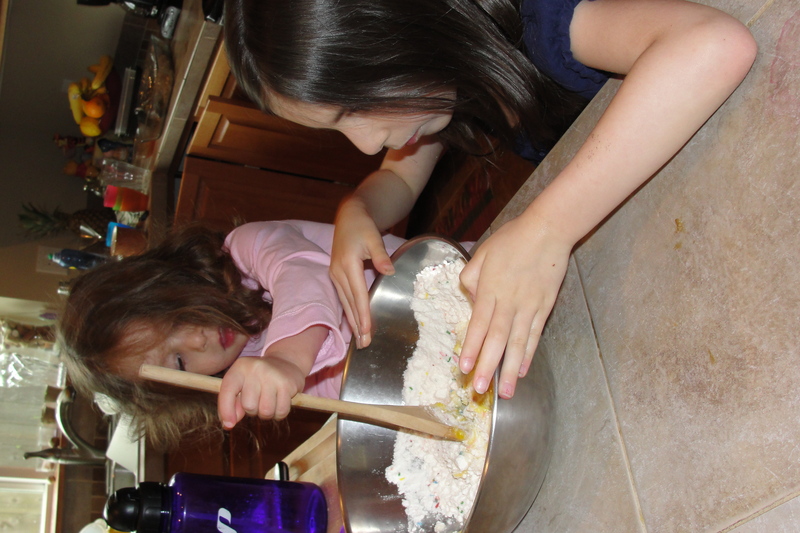 They take turns stirring (and Mama gets to sample the batter…). Emily is our designated cookie shmoosher when we make snickerdoodles or other shaped cookies like these. 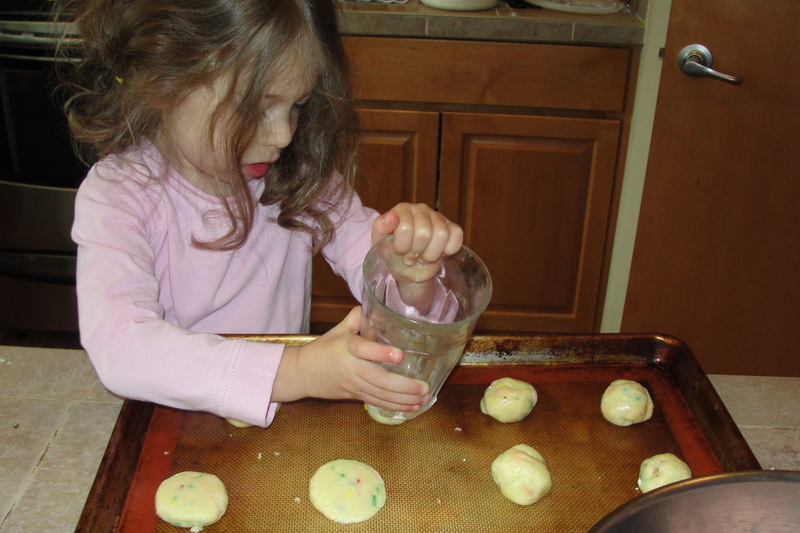 Cheery, rainbow sprinkled Funfetti cookies – so easy! Can you believe that actually sell a cake mix cookie mix now? It’s the same as the cookie recipe on the side of the box and they charge literally 3 times as much! These are so easy (even my kids can do it on their own!) and sooo yummy. Who doesn’t love Funfetti?! 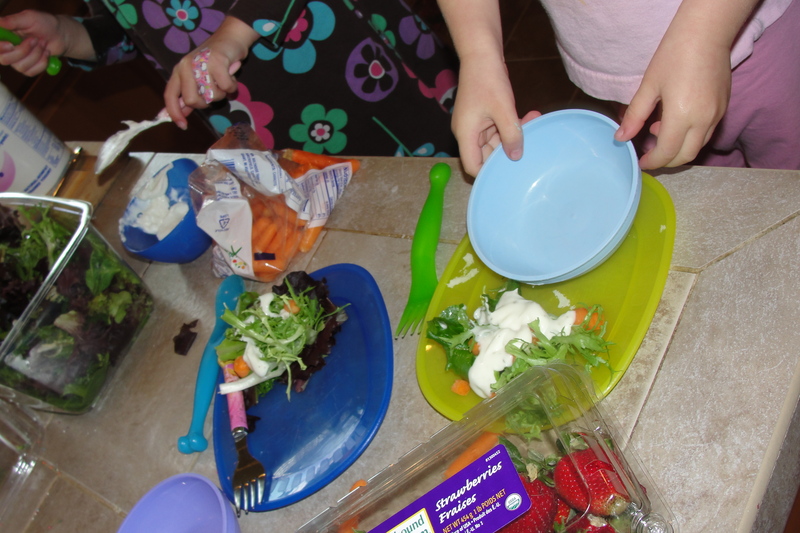 The menu (kids’ choice): salad (with sliced up baby carrots and cucumbers) and Greek yogurt with strawberries and bananas. We use the cheapy plastic IKEA cutlery and the knives are great at slicing soft or small things. Mama has been cooking a lot of new recipes lately, and this is one that I am now addicted to. It’s from a recent copy of Cooking Light and it’s by my favorite go-to guy, Mark Bittman. Isn’t it pretty? 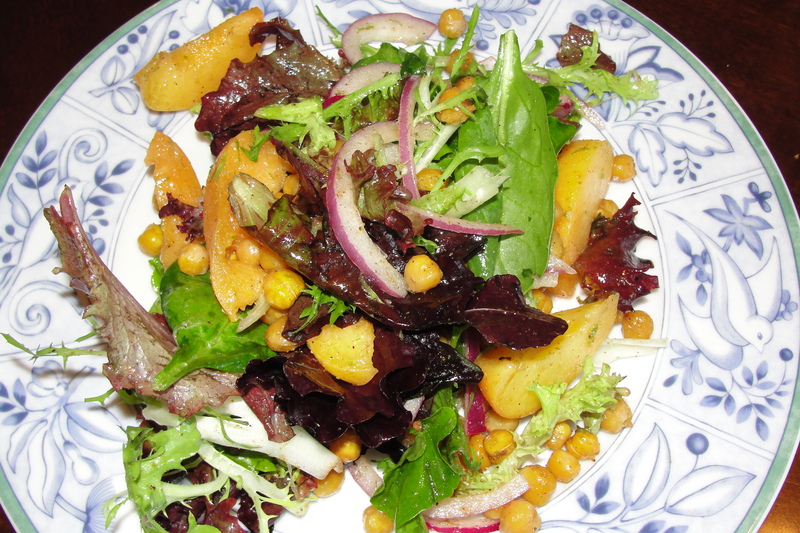 I can’t wait to make this for lunch all summer long with plums or peaches after apricot season is over. 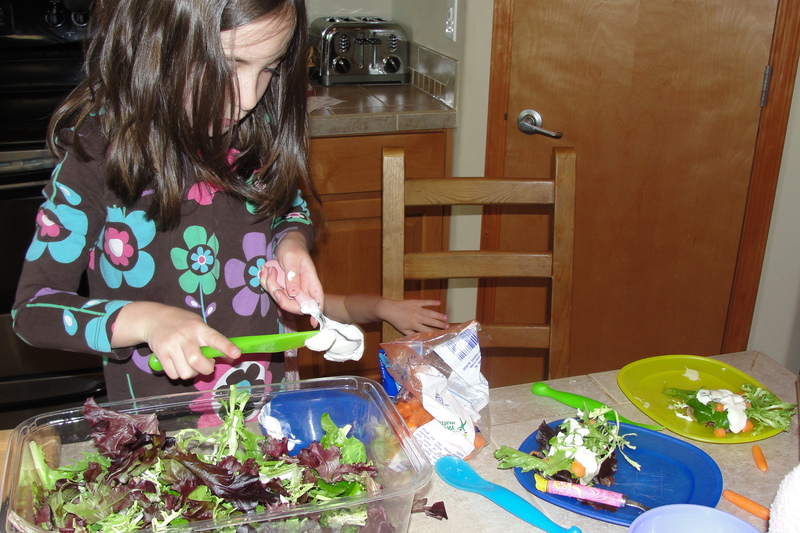 What are you (or your kids) cooking lately?